Supermarine Scimitar Video - Crash on HMS Victorious? The Supermarine Scimitar was a British naval fighter aircraft operated by the Royal Navy Fleet Air Arm. The prototype for the eventual production version flew in January 1956 and production aircraft were delivered in 1957. It saw service with the Royal Navy from 1958 until 1969. 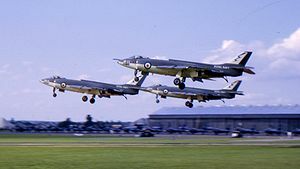 The Scimitar stemmed from a number of designs from Supermarine for a naval jet aircraft, initially to a requirement for an undercarriage-less fighter aircraft to land on flexible "sprung" rubber decks, which would allow for a lighter and simpler structure. Supermarine's design to meet this requirement was the Type 505, featuring a thin, straight wing and a V-tail (or 'butterfly tail') to keep the tail surfaces away from the jet exhausts, and to be powered by two Rolls-Royce Avon turbojets, mounted side-by-side in the fuselage. In 1948, the Admiralty had second thoughts about the undercarriage-less fighter, and Supermarine reworked their design by including a nosewheel undercarriage, becoming the Type 508. The Vickers-Supermarine Type 508 was the first Scimitar ancestor, and shared the basic layout of the Type 505, i.e. a twin-engined straight-winged type with V-tail (or 'butterfly tail'). Pitch control was by moving the whole tail, with elevators for additional pitch control when working in tandem, and to replace the rudder on a conventional tail when working differentially. Ailerons were fitted to the wings for lateral control, and both leading and trailing edge flaps were also fitted to the wings. An order for three Type 508s was placed in 1950, to Specification N.9/47. The first Type 508 made its maiden flight from Boscombe Down airfield on 31 August 1951, with the aircraft carrying out carrier trials aboard HMS Eagle in May 1952. 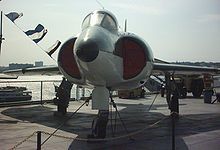 The second aircraft had significant differences, carrying a cannon armament, and different enough in detail to be redesignated the Type 529, flying for the first time on 29 August 1952. One unusual modification was the larger tailcone that was to accommodate a proposed tail-warning radar. The maximum speed of the straight-winged Type 508 and 529 was relatively modest, with the Type 529 reaching 607 mph (977 km/h), and it had already been decided when the Type 508 first flew to redesign the third prototype with swept wings to improve performance. The resulting Type 525 also featured conventional swept tail surfaces as well as blown flaps to reduce the aircraft's landing speed, and first flew on 27 April 1954. It later crashed but the basic design had already proved sound enough to proceed with an outwardly fairly similar looking aircraft, the Type 544, to specification N113. A total of 100 were ordered although the Royal Navy had changed the specification to a low level strike aircraft with nuclear capability rather than a dedicated fighter. The first of the N113s serving as prototypes for the later production series flew on 19 January 1956. The aircraft evolved more with the third N113 incorporating different aerodynamic changes and a stronger airframe strengthened for the new low level role. Various aerodynamic "fixes" to try and counter pitch-up effects at high speed and altitude included flared-out wingtips and wing fences. The tailplane was also changed from dihedral to anhedral. The combined modifications led to the final N113 being considered the "production standard". The first production Scimitar flew on 11 January 1957. At the time of introduction the Royal Navy only had a couple of large carriers, most were still quite small and the Scimitar was a comparatively large and powerful aircraft. Landing accidents were common. The Scimitar suffered from a high loss rate; over all types of accidents 39 were lost. The aircraft was perceived by many as too innovative mechanically. It pioneered fuel flow proportioning and integral mainplane tanks along with "blown" flying surfaces to reduce landing speeds. At one time, it held the notorious record of 1,000 maintenance hours per flying hour. Although the Scimitar could be equipped as a fighter the interceptor role was covered by the de Havilland Sea Vixen. In the attack role it was replaced by the Blackburn Buccaneer. The Scimitar was retained initially as a tanker to compensate for the early Buccaneer's low engine power. A Buccaneer would take off with minimum fuel then top up from a Scimitar. Type 508 Straight-wing research aircraft. Type 529 Straight-wing research aircraft. Type 525 Swept-wing research aircraft. Buttler, Tony. "Type Analysis: Supermarine Scimitar". International Air Power Review. Norwalk, Connecticut, USA:AIRtime Publishing. Volume Two, Autumn/Fall 2001. ISBN 1-880588-34-X, ISSN 1473-9917. pp. 158-173. Morgan, Eric and John Stevens. The Scimitar File. Tonbridge, Kent, UK: Air Britain (Historians) Ltd., 2002. ISBN 0-7110-2034-5.